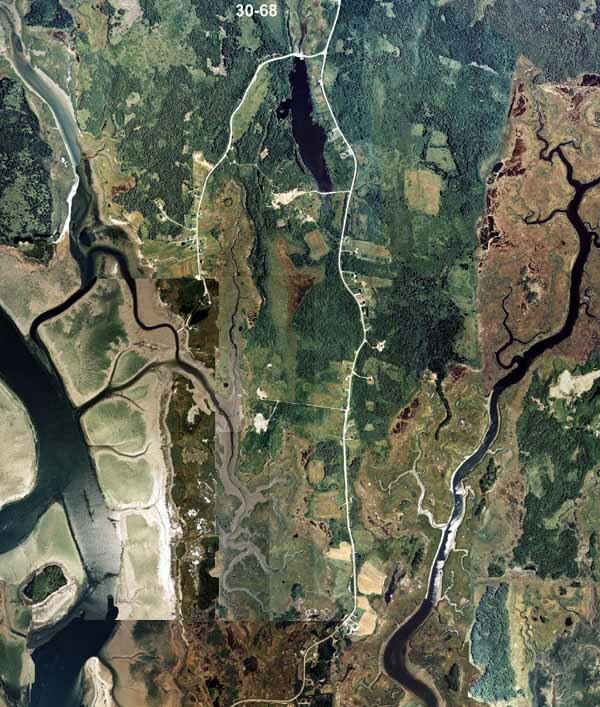 Melbourne, known in early times as a part of the area known as East Chebogue, received its name April12th, 1872, by a community vote at a meeting for naming the area beginning at the south end of the arcade community line. The name "Melbourne" was chosen in honor of Lord Melbourne, a British Prime Minister. Captain Ephrim Cook, who came to these shores from New England in 1760-1761 on fishing voyages during the summer, moved with his family in 1762, settled on land in lower Melbourne near Cooks Beach ( named in his honor), built a house from materials he brought with him and made his home. He was the first settler here, built fishing stands at the beach, also a store house for trading on the knoll today known as "Store Hill" where the well is still in use. Capt. Cook built vessels, and was the first to cure and ship salt fish to the West Indies. He built the first house in the County, was the first one to employ men in the fishing industry, was first Registrar of Deeds (appointed in 1767), and the first Justice of the Peace in the County. He died in 1821 and was buried near his farm. Cofferan, Iseral Doane and Jonathan Horton. These men all settled lands for farms; others operated saw mills and built vessels and ships; a great many of their descendants were lost at sea. Capt. Hersey had a saw-mill on one side of a creek near Durkee's Island, while Capt. Durkee had one built on the opposite side, which area became known as Mill Creek. Later years when the mills had ceased to exist the mill dams remained and the creek was referred to as the "Dam Creek" or "Old Dam Creek". Timbers were sawn here for the shipyards nearby. Capt. Durkee owned the first extensive property of Durkee Island which he made into a large farm. He employed men to operate the farm and mill, while he followed his sea-faring career. The once lower road to the Mill Creek which followed to Durkee's Island was built in 1776 and is now no more. The road used today, which was built through the pasture lands, was an early one being in use in 1864. 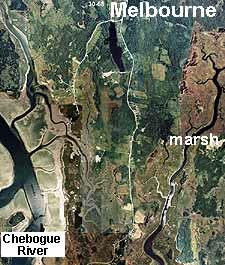 The island is now owned by the family of the late Frank Cook of Chebogue. Melbourne Pond as known today was once called "Chebogue Lake". It is now a bird sanctuary where great flocks of Canada Geese and wild ducks line the shores in winter - a remarkable sight. The first school house was built in 1840 on what was then and is still known as Pinkey Hill. It burned in 1863. The well is still there. The second school was built in 1864 on the east side of the road across from the Andrews home. It burned in 1871. The third school was built in 1872 on land at the junction to the Little River Road. This was taken down in 1947,and the material sold for building a home on the Plymouth Road, now owned by Douglas Nickerson. A larger school house was built in 1946 beside the old building, before it was moved away. This was used until the Arcadia Consolidated School was opened in Arcadia where now all pupils attend. The fourth school building is now known as the Melbourne Community School Hall. A Free Baptist Church was built in 1832 on the corner of a branch road to Little River and was known as the Little River Church. This was taken down in 1961, having been closed many years. Land for this building was donated by Zadok Hersey. There was never a post office building in Melbourne, but mail was dispensed from the home of an appointed postmaster. A rural route now serves the area. The old Horton private cemetery is the largest known in Melbourne, though many burial places are scattered over various homestead plots. First burial in the Horton Cemetery was in 1808. This secluded area of five graves is situated on a hillside on the east side of the road where yellow daffodils still bloom in the spring. A Catholic Mission Church was built in 1958, and a rectory was built in 1967. Road pavement was finished during the centennial year.